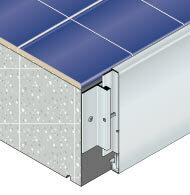 Extruded aluminium Solins with CSTB technical approval provides protection for roof covering upstands on flat roofs. 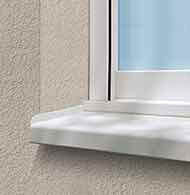 The Solinet® range allows the waterproofing to be in accordance with DTU 20.12 (necessary accessories). Our systems are designed to protect against rainwater, for the insulation of flat roofs with or without slabs on pads, for public works and for the mechanical fixing of PVC membranes. 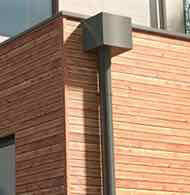 The Solinet® range is deliverable in standard length of 3000 mm and factory-drilled at 300 mm centres. Each length is stamped with the dani alu guarantee trademark. "The use of metallic flashing strips is compulsorilyy justified byt he Technical Opinoin CSTB DTU 20.12"
Under what circumstances am I? Have I properly analysed my problem? In the event of doubt, call us. 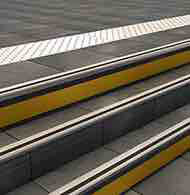 Under what accessibility conditions am I? Does the work include a lot of angles to be dealt with, curved sections? In what climate zone is the site located? What overlap or visible height do I need? Have I received the technical supervisor‘s approval of the pattern of Solinet proposed? Does the roof covering upstand include insulation? The foam at the rear allows any unevenness to be rectified and creates a barrier between the water-tighness and the pump seal. 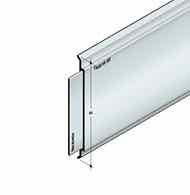 Adequate gorge with joint backing, which allows the sealant gun to move three dimensionally. 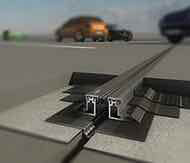 Junction sleeves provides a perfect alignment between units and an effective joint overlap, while still allowing expansion. 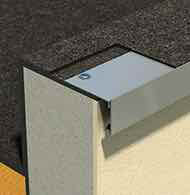 Hides grooves, saves on fixtures and leaves a thorough and watertight finish. The aluminium protective cover protects the fixture from the weather, and the gun-applied sealand from UV, providing an attractive finish. 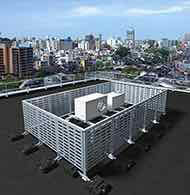 It is mandatory on a flat roof top accessible to the public. 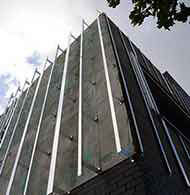 Profiles in standard length of 3000 mm, factory-drilled at 300 mm centres. In accordance with the technical approval, accessories are necessary in order to guarantee a perfect sealing and finish. Solinet® 160, covering plinth, allows the self-sufficient of the upstands, a invisible fixing and waterproofing safe from the weather and UV, a free expansion of the covering profil and a innovative aesthetic. 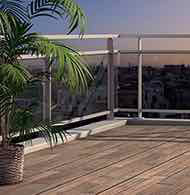 This system is suitable for accessible terraces or circular ways where aesthetic and safety are needed. 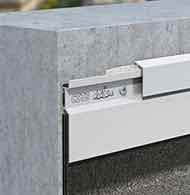 A covering plinth (overlap skirting) allowing to have an invisible fixing and waterproofing, in addition to a mechanical protection of the upper mastic joint. 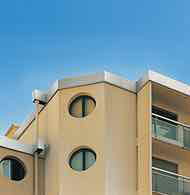 In compliance with the technical approval, accessories are needed to guarantee complete weatherproofing and a perfect finish. 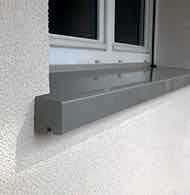 a Solinet® 10/50 in extruded aluminium with squared gorge and double joints pre-installed in factory, used as support. 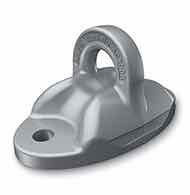 Bracket 10 mm - Cover 125, 150, 175 and 200 mm. Other dimensions on request. 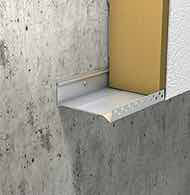 Invisible fixings - Innovative and appealing for renovation. Extruded aluminium solin with squared gorge and pre-installed double joints in factory. 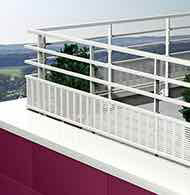 support for slabs on pads around the perimeter of the flat roof. 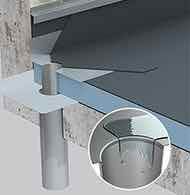 Fixnet series is used for a mechanical fixing of the waterproofing membranes. The model 40 is bendable. 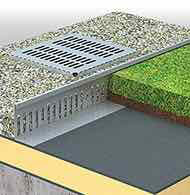 mechanical fixing of the waterproofing membranes. 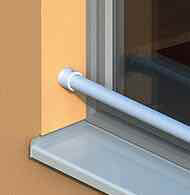 Bendable extruded aluminium solin with squared gorge with factory-fitted double joints. Cover 50 mm. For protecting and connecting the waterproofing upstands in traditional covering. 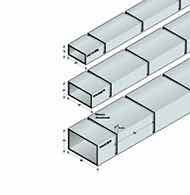 Profiles in standard lengths of, factory-drilled at 300 mm centres.